These last two articles are written by me and definitely reflect the perspective of Two Kingdom Theology. I hope you find all of these articles helpful, and I welcome contributions to the list from the blog's readers as well. Note: It is important before we get into the Parable of the Persistent Widow to understand the context in which Jesus tells the parable. The context is provided in chapter 17, in which we have the account of Jesus' response to a question from the Pharisees about the coming of the kingdom, followed by Jesus teaching the disciples about His second coming. He instructs them about a delay in His return, and He tells them about its visible and sudden nature when it does occur. So, in order to get the context of the parable clear in our minds, it is important to begin reading the text at least as far back as 17:20. Introduction: Warren Wiersbe has written that “The ability to calm your soul and wait before God is one of the most difficult things in the Christian life. Our old nature is restless … the world around us is frantically in a hurry. But a restless heart usually leads to a reckless life” (Men’s Life, Spring, 1998, as cited here). NKJ Isaiah 40:28-31 Have you not known? Have you not heard? The everlasting God, the LORD, the Creator of the ends of the earth, neither faints nor is weary. His understanding is unsearchable. 29 He gives power to the weak, and to those who have no might He increases strength. 30 Even the youths shall faint and be weary, and the young men shall utterly fall, 31 but those who wait on the LORD Shall renew their strength; they shall mount up with wings like eagles, they shall run and not be weary, they shall walk and not faint. Thus waiting for our Lord's return requires patience, but it also requires persistence in prayer, and this is the reason for the parable we are studying this morning, to which we shall now turn our attention. We will examine the parable under three primary headings: 1) the aim of the parable, 2) the assertion of the parable, and 3) the application of the parable. We find the aim of the parable in verse 1. Luke gives us a two-sided description of the purpose Jesus had in mind in telling this parable, from both a positive and a negative angle. Positively, Jesus wants us to be persistent in praying. He wants us to pray “always,” or at all times, no matter what the circumstances, but especially in the face of the trials that will be our lot as we watch for His return (for this is what the preceding context is about). Negatively, Jesus wants us not to be discouraged in praying. Actually, the Greek word translated by most modern translations as “lose heart” can have the idea, “to give in to evil, to become weary, to lose heart, [or] to turn coward” (Linguistic Key to the Greek New Testament, p. 194). Thus the Linguistic Key to the Greek New Testament aptly observes in its treatment of the word that “real courage requires that we leave the problem with God” (p. 194). Jesus assumes, then, that we will face some sort of opposition to persistent prayer and that it will be difficult for us to be steadfast in prayer. He knows that persistent prayer in the face of evil can be hard. He knows that we get tired. He knows that we can all too easily become discouraged. And He knows that we can actually be afraid to trust God with our lives. But He doesn't want us to give up! This is why, Luke tells us, that Jesus related this parable. Luke is also letting us know that, after we are finished studying this parable, we should be encouraged to be persistent in prayer as we await Christ's return, and we should be better able to leave our lives in God's hands, trusting that He knows best, no matter what our circumstances may suggest. And this leads us to our next major heading. We find Jesus' assertion of the parable in verses 2-5. The description of this judge identifies him as a godless man, who has no concern to keep either of the two greatest commandments. He loves neither God nor his neighbor! This is basically what Jesus means when He says that this judge “did not fear God nor regard man.” What a terrible judge for a desperate person to have to come to hoping for justice! Yet Jesus goes on to describe just such a desperate person continually coming before this awful judge. Thus, although Jesus does not give any details about this widow, those who heard the parable would have understood her as a person who had no one to stand up for her, especially since she has had to resort to relying on such a terrible judge for help. What the woman was seeking from the judge was what she could not get otherwise, namely “justice,” as the Greek word is rendered in the NKJV. But the word could also be taken in slightly different ways. 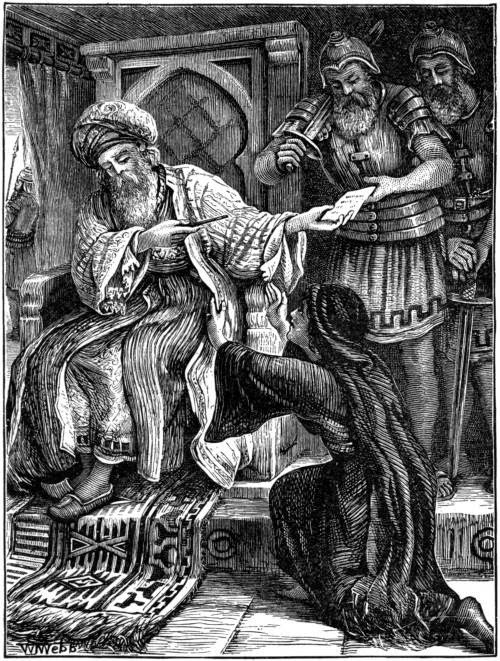 For example, the King James Version renders that widow's plea, “Avenge me of mine adversary.” And the New American Standard Bible has the widow saying, “Give me legal protection from my opponent.” However we understand the verb here, the point is still that the widow wanted the judge to help her by providing justice, whether it was punishment that an adversary deserved or whether it was legal protection from such an adversary. It is also worth noting that we should assume that the woman's cause was indeed a just one. Otherwise the parable would hardly make sense as an analogy for prayer that we should expect God to answer by granting our request. At any rate, given that this was a judge who did not care either about what God would have him do or about the woman who kept coming before him, he refused for a while to grant her justice, as the next verse says. Now, the Greek verb translated weary – hupōpiázō – literally means to “strike beneath the eye” or to “give a black eye” (Friberg #27682, BibleWorks). But it has to be taken here in a figurative sense, much as when we say today that we give someone a black eye when we embarrass him or damage his reputation in some way. As Klyne Snodgrass puts it, “even though [the Greek word] connotes physical violence, its use here is surely metaphorical or sarcastic. The judge fears not that the woman will strike him but that she will annoy him to death” (Stories With Intent: A Comprehensive Guide to the Parables of Jesus, p. 458). Or as the Linguistic Key to the Greek New Testament says, the Greek verb is used here “in the sense of 'to annoy' or 'to disgrace' in the sense of losing prestige” (p. 194). But, whether the judge simply grew tired of what he viewed as an annoyance, or whether he was concerned that the widow would eventually damage his reputation by making him look as bad as he really was, Jesus' point is clear: The widow will get the justice she seeks because she persists in her request and does not give up. And with this we come to our final point. We find Jesus' application of the parable in verses 6-8. Here we see that Jesus intends this to be a how much more parable, in which He draws a contrast between some other person and Himself or God. In this case, Jesus is basically saying that, if even an unjust judge will grant justice to one who is persistent in her request, then how much more will God grant justice to those whom He has chosen to be His own, to His elect. ESV Luke 18:7 And will not God give justice to his elect, who cry to him day and night? Will he delay long over them? NAU Luke 18:7 … now, will not God bring about justice for His elect who cry to Him day and night, and will He delay long over them? NKJ Revelation 6:9-11 When He opened the fifth seal, I saw under the altar the souls of those who had been slain for the word of God and for the testimony which they held. 10 And they cried with a loud voice, saying, “How long, O Lord, holy and true, until You judge and avenge [ἐκδικέω] our blood on those who dwell on the earth?” 11 Then a white robe was given to each of them; and it was said to them that they should rest a little while longer, until both the number of their fellow servants and their brethren, who would be killed as they were, was completed. On the other hand, one could say that Jesus also thinks of God as acting without delay in responding to the requests of His people for justice, especially given what Jesus says in the next verse. NKJ Luke 18:8a I tell you that He will avenge [ποιήσει τὴν ἐκδίκησιν, do justice] them speedily [ἐν τάχει]. Although we may “cry out to God day and night” (vs. 7) and his justice may thus seem to us to be delayed, Jesus assures us that in God's plan it comes “speedily,” that is without delay. It is clear that this cannot mean that God will answer our prayers for justice immediately as we await the Lord's return, for in this case why does Jesus bother with telling the parable? Why does He prepare us for the necessity of being persistent in prayer and not giving up, if He actually thinks God will always answer right away? The apparent difficulty is alleviated when we remember that this parable is given in an eschatological context – dealing with the second coming of Christ – and that, in such a context, God's timetable and ours are not the same. What may seem long to us is right away to God, for it is right on His timetable. NKJ 2 Peter 3:8-9 But, beloved, do not forget this one thing, that with the Lord one day is as a thousand years, and a thousand years as one day. 9 The Lord is not slack concerning His promise, as some count slackness, but is longsuffering toward us, not willing that any should perish but that all should come to repentance. In other words, we cannot judge what is soon to God by our own standard of time. We cannot assume that, because we are tempted to be impatient, God is somehow too slow in His timing. We cannot assume that God must work in accordance either with what we think must be done or when we think it must be done. As I have already indicated, I think it is right to thus interpret the parable in the context of Jesus' second coming, since that is what leads up to His telling the parable in the first place. But just in case we missed this emphasis, Jesus makes it clear in His final question. NKJ Luke 18:8b Nevertheless, when the Son of Man comes, will He really find faith on the earth? That is, when Jesus comes, will He find the kind of trust in God that persists in prayer without giving up, despite all the temptations to quit believing and to quit praying? This is what Jesus must have in mind here. I think this hits the nail on the head! Jesus wants us to take His faithfulness as a given, but He also wants us to admit our own weakness in this regard and thus continue to trust in His faithfulness rather than our own strength. He knows how fickle and fainthearted we can be, so He wants our faith to be anchored in His faithfulness. For it is only when we trust in His faithfulness that we ourselves may be found faithful. Now, that card might not be such a bad one for the funeral of a believer in Christ, but it definitely wouldn't be a good one for the funeral of an unbeliever. And today we will think about why this is so, as we examine the Parable of the Rich Man and Lazarus. For one of them could have been congratulated on his new location, but the other could definitely not have been congratulated! As we focus our attention on the parable today, we will see that our Lord Jesus essentially gives it a two part structure, so we will follow this structure and examine it under two primary headings. We we look first at the contrast between the rich man and Lazarus, and then at the rich man's conversation with Abraham. As the NET Bible notes put it, this man “'celebrated with ostentation' (L&N 88.255), that is, with showing off. Here was the original conspicuous consumer” (BibleWorks). Lazarus: NKJ Luke 16:20-21 But there was a certain beggar named Lazarus [Lázaros is the Greek form of the Hebrew ’el‛āzār, which means God has helped, probably the reason Jesus gives this name to this character], full of sores, who was laid at his [the rich man's] gate, 21 desiring to be fed with the crumbs which fell from the rich man's table. Moreover the dogs came and licked his sores. 1) We are told that he was a “beggar.” He was so poor that he had to beg in order to live. Apparently he was unable to work, and we will see why as we look at the rest of Jesus' description of him. 2) We are told that he was “full of sores.” Whatever sickness he had, it certainly wasn't pleasant! This poor man must have been miserable! Such a condition would also have rendered him unclean so that most people would want to avoid him. 3) We are told that he was “laid at [the rich man's] gate.” Apparently the man could not walk himself and had to be carried and laid at his gate. The reason for this would be obvious. Since the rich man was so incredibly wealthy, there would have been hope that he would have given alms to Lazarus to help him in his sickness and poverty. 4) We are told that he was “desiring to be fed with the crumbs which fell from the rich man's table.” As poor Lazarus laid at the gate – not welcomed into the house – he was so hungry that he could only dream about the kind of scraps that would fall onto the floor under the rich man's table. 5) We are told that “the dogs came and licked his sores.” This must have been a painful nuisance, but it also tells us that Lazarus was so weak that he couldn't keep the dogs away. And apparently there was no one to help him once he had been dropped there at the gate. Lazarus: NKJ Luke 16:22a So it was that the beggar died, and was carried by the angels to Abraham's bosom. Whereas Lazarus had been carried and placed in front of the rich man's gate when alive, left out of the party only to dream of the scraps from the table, now we are told that, after he died, the angels carried him to “Abraham's bosom.” This is a reference to his being where Abraham is and his being close to Abraham, which would be a place of honor. The picture is of a feast where people are reclining at a table. They would all be reclining on their left side, leaning on their lefts arms, and Lazarus is right in front of Abraham so that, when he leans back, he leans right against Abraham's chest. The situation is similar to that of the Apostle John when he reclined at the table with Jesus in the Upper Room and later told us that “there was leaning on Jesus' bosom one of His disciples, whom Jesus loved” (John 13:33) At any rate, the point is that Lazarus isn't missing the party any more! We find the conversation of the rich man with Abraham in verses 24-31. In this section of the parable we are told about two requests made to Abraham by the rich man, along with Abraham's two responses. This is then followed by an objection made by the rich man and Abraham's response to that objection. We see the rich ma's first request in verse 24. Often we are tempted to think that when people die and end up in a place of torment they will somehow finally be sorry for what they have done, and thus we might be tempted to think it doesn't seem fair that they should continue to suffer so horribly. But this parable indicates that those who are hardhearted in this life will only continue to be so in the afterlife. Thus they will most definitely continue to deserve the punishment they receive. After all, they won't cease to be sinners just because they are being tormented. We see Abraham's response in verses 25-26. Abraham isn't simply rubbing it in that the rich man is suffering so much. He is reminding him that it is his own fault. And when he says to the rich man that “in your lifetime you received your good things, and likewise Lazarus evil things,” he is implying that it didn't have to be that way. The rich man could have helped Lazarus, but he didn't. So he cannot receive help from Lazarus now. We see the rich man's second request in verses 27-28. Finally the rich man begins to think of someone other than himself, but notice that there is an implied excuse for his predicament in what he says to Abraham. He implies that he wouldn't have ended up in this place of torment if there had been someone to warn him. You see, even when he is getting the punishment he deserves, and even after Abraham himself points this out to him, the rich man still wants to pass the buck. But Abraham doesn't buy it, as we shall see. We see Abraham's response in verse 29. Here Abraham makes it clear that the rich man did have a warning. He had the Word of God! And his brothers also have this same Word. And Abraham clearly believes that this Word is sufficient! So here we can discern the reason Lazarus was with Abraham instead of with the rich man in torment. It was because he had heeded God's Word. He must have heard “Moses and the prophets” and believed God's Word, whereas the rich man clearly had not. However, the rich man isn't done defending himself, which we will see in next. We see the rich man's objection to what Abraham has said in verse 30. We see Abraham's final response to the rich man in verse 32. Abraham dispels the notion that so many unbelieving people seem to have today, namely that if they could only see a great miracle of some kind, then they would believe. But this just isn't true. Those who refuse to believe the Scriptures will not believe even if they see someone raised from the dead. No wonder Jesus said on another occasion that “An evil and adulterous generation seeks after a sign” (Matt. 12:29). For it is truly an evil generation that refuses to believe God's Word and thinks a sign will make all the difference! So, if you are among those who secretly think that if only God would do some great thing, then you would believe in Him, I must tell you that you are wrong. If you will not believe the Scriptures, then you won't believe no matter how many miracles you might see. And believe you must because – as this parable makes clear – we only get the opportunity in this life to believe. And if we don't believe in this life we can only expect an irrevocable judgment in the afterlife. The driver of a hearse foolishly tried to warm himself on a rainy Saturday morning by drinking on the job. He didn't get warm (alcohol actually lowers body temperature), but he did get lost on the way to the cemetery. The funeral procession waited in vain at the grave for hours. Later that evening, police found the driver asleep in the hearse by the side of the road. By then it was too late for burial, and the cemetery wouldn't accept the casket on Sunday. Actually, his final appointment was kept right on time. His tardy burial in no way altered the fact that his conscious soul had passed into eternity precisely at God's appointed time. That is a good question, isn't it? Are you ready for what comes when you die? Have you believed God's Word as revealed in the Scriptures? Have you trusted in Jesus Christ as Lord and Savior? If not, I pray that He may grant you faith and repentance today, for it may be your last opportunity to trust Him. Notice first as we read the parable that Jesus is aiming it at His disciples. This means that He is giving instruction about how we as His disciples are supposed to live. We should keep this in mind as we read the parable, especially since the main character may at first surprise us and tempt us to think Jesus must have had some other group in mind. Introduction: Pastor Herbert Vander Lugt once wrote, “Money can't buy happiness or eternal life. But when invested in Christ's cause, it pays eternal dividends” (Our Daily Bread, February 8, 1995). I think this pastor has hit on a major lesson of the parable before us this morning, and I hope we will all learn this lesson, among others, as we examine the text more closely. In order to understand what Jesus wants us to learn from this parable, we will examine the passage under two primary headings: 1) the assertion of the parable, and 2) the application of the parable. There are essentially three stages to this parable, each centering on the steward. I have called them 1) the steward's predicament, 2) the steward's plan, and 3) the steward's prudence. 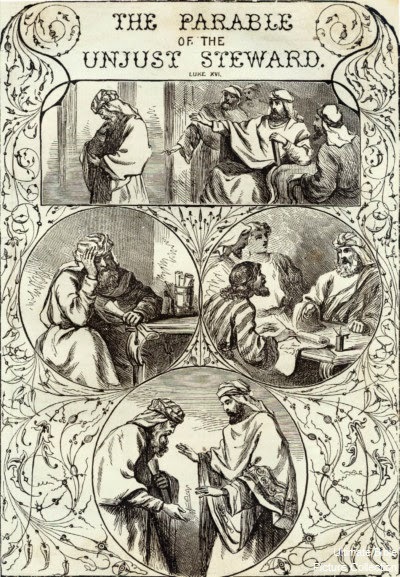 The steward's predicament is seen in verses 1-2. We know that the steward was not falsely charged because 1) he did not try to defend himself, and 2) he is later called an “unjust” steward in verse 8. So the steward has created a pretty bad situation for himself by misusing his master's money. And now he is about to be out of a job. This leads us to the second part of the parable. The steward's plan is seen in verses 3-4. We know this steward was a hired man rather than a slave because a slave would have been severely punished and given some other menial task to do, whereas this man is simply in danger of losing his job. And when he thinks of his future, he doesn't think he will get another job as a steward. He doesn't even contemplate that possibility, no doubt because he was guilty of the charges brought against him and therefore knew no one else would want to hire him. So he thinks about the kind of work he might realistically be able to do and concludes that he may become a manual laborer – someone who has to dig, for which he is not suited – or a beggar – something his pride will not allow him to do. So, the steward comes up with another plan, a plan that will provide him a place to live for quite some time and, as we shall see, a plan which involves taking even more of his master's money! This leads us to the third part of the parable. The steward's prudence is seen in verses 5-8a. NKJ Luke 16:5-8a So he called every one of his master's debtors to him, and said to the first, “How much do you owe my master?” 6 And he said, “A hundred measures [βάτος, bath] of oil.” So he said to him, “Take your bill, and sit down quickly and write fifty.” 7 Then he said to another, “And how much do you owe?” So he said, “A hundred measures [κόρος, kor] of wheat.” And he said to him, “Take your bill, and write eighty.” 8 So the master commended the unjust steward because he had dealt shrewdly [φρονίμως]. The amount of the debts is very large, although suggestions of the exact figures vary. One hundred baths of oil … would be equivalent to about 800 or 900 gallons, the yield of possibly 150 olive trees and equivalent to the wages of about three years for the average worker. One hundred kor of wheat would be almost 1100 bushels, probably enough to feed 150 people for a year, the produce of 100 acres, and equivalent to seven and one-half years of labor for the average worker. In each case the steward reduced the bill by the same amount, about 500 denarii or the wages of more than two years for a day laborer. The parable tells of large business dealings. None of the people involved are poverty-stricken peasants or even people with average incomes. The reason it is important for us to see how big the amounts of the reductions were is so that we can see how much the steward was actually providing for his future. In a culture where reciprocity would have been expected, and where the people whose bills were reduced by so much would have been very grateful, the steward had saved these debtors a total of somewhere between four or five years wages they might have had to pay a day laborer. No wonder he felt confident that they would give him a place to stay when he got fired! Now, Jesus is not commending the sinful actions of a thief here, but is only speaking of the unexpected manner in which He Himself will one day return. In the same way, Jesus is not commending the sinful actions of the steward in this parable, but is teaching the kind of wisdom even a sinful man has in planning for his future. Thus this is really another “how much more” parable, which essentially says that, if a sinful man can be wise enough to prepare for his future on earth, then how much more should a believer be concerned to prepare for his eternal future. And this leads us to Jesus' application of the parable. We find the application of the parable in verses 8b-13, and there are at least five lessons we may learn from Jesus' application of this parable. 1. We must wisely plan for our eternal future. This is the point of the last half of verse 8. NKJ Luke 16:8b For the sons of this world are more shrewd in their generation than the sons of light. In the context this statement is an accusation by Jesus against His disciples – the “sons of light” – who often seem less concerned about their heavenly future than the sons of this world are about their earthly future. But Jesus wants us to be planning throughout this life for the next one. That this is Jesus' point is clear from the parable and also from the next point that He makes. 2. We must use our money in this life to reap rewards in the next life. This is taught in verse 9. NKJ Luke 16:9 And I say to you, make friends for yourselves by unrighteous mammon, that when you fail [NU has the third person form of the verb and reads “when it fails”], they may receive you into an everlasting home. Whether the original text has the second person pronoun – “when you fail”– or the third person pronoun – “when it fails” – makes little difference, because the person's death is in mind either way. We fail ultimately when this life ends, and our money certainly fails us when this life ends as well. The point Jesus is making is that if we use our unrighteous mammon, the money of this world, which tends to corrupt and which can be so easily misused, to help others, then they may ultimately receive us into our eternal dwelling. That is, they may be influenced by our kindness to trust in the Lord for themselves, and therefore may just be there to welcome us as we inherit our eternal reward. A mortician at Forest Lawn Cemetery in California told author Gilbert Beers about a man who many years ago spent $200,000 on his own funeral. Estranged from his wife and children, that bitter man squandered all his money on his own burial and left them nothing. Because the casket and other expenses added up to only $100,000, he ordered that the remaining $100,000 be spent on orchids! Only three people attended that memorial service. What a warped sense of values! What a waste of money that might have been used to help the needy or to support a worthy cause! And what a lesson we can learn from such egocentric folly! We all need to ask ourselves if we are squandering the resources God has entrusted to us on worthless things. If so, we need to heed what Jesus said in Luke 16:9, “I tell you, use worldly wealth to gain friends for yourselves, so that when it is gone, you will be welcomed into eternal dwellings” (NIV). I think this makes the point pretty well, but before moving on it is important to emphasize, as does the New Geneva Study Bible notes, that “salvation by works is not being taught.” Instead, Jesus is indicating that “the loving help given to others in this life is a sign of genuine discipleship and salvation already enjoyed rather than a meritorious ground of salvation” (p. 1636). 3. We must recognize that faithfulness with what we have – not how much we have – is the important thing. This is taught in verse 10. NKJ Luke 16:10 He who is faithful in what is least is faithful also in much; and he who is unjust in what is least is unjust also in much. Notice that the focus is on one's character. A faithful person is a righteous person rather than an unrighteous or unjust person. How we handle money in this life is indicative of our character, whether the amount of money is little or great. 4. We must recognize that God will not entrust us with the true riches of the kingdom if we cannot be faithful with riches of this world. This is taught in verses 11-12. NKJ Luke 16:11-12 Therefore if you have not been faithful in the unrighteous mammon, who will commit to your trust the true riches? 12 And if you have not been faithful in what is another man's, who will give you what is your own? We can actually find this same principle applied in others ways in Scripture as well. Consider, for example, what Paul says to Timothy about the qualifications for elders. He says that an elder must be “one who rules his own house well, having his children in submission with all reverence,” and then goes on to ask, “for if a man does not know how to rule his own house, how will he take care of the church of God?” (1 Tim. 3:4-5). In the same way, I think Jesus is aiming this lesson especially at His closest disciples who would go on to be leaders in the Church. If they can't handle stewardship over earthly things, then how will they be able to handle stewardship of the things of God? And if they can't serve faithfully under the authority of other men, then how will they be able to be given authority of their own in the kingdom? Notice that both of these questions expect a negative answer, namely that God will not entrust true riches to those who can't even handle worldly riches, and He will not give anyone things of their own to oversee if they can't oversee things on behalf of others. 5. We must remember that how we use our money indicates who our true master is – God or mammon. This is taught in verse 13. NKJ Luke 16:13 No servant can serve two masters; for either he will hate the one and love the other, or else he will be loyal to the one and despise the other. You cannot serve God and mammon. How easily we are enslaved by worldly riches! And how gracious Jesus is to warn us about it! We all too easily think we can serve both, perhaps serving mammon just a little bit and God just a little bit more. But Jesus makes it clear that there can be no divided allegiance here. It is an either/or proposition. And if we serve mammon even a little bit, then we love it rather than God, and we serve it rather than God. Period. How we handle money reveals much about our priorities. That's why Jesus often talked about money. One-sixth of the Gospels' content, including one out of every three parables, touches on stewardship. Jesus wasn't a fundraiser. He dealt with money matters because money matters. For some of us, though, it matters too much. That is a very good question, isn't it?